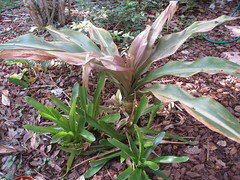 The south winds from Tropical Storm Fay snapped a few leaves on the 'Queen Emma' crinum in the front yard. It should be fine, but it doesn't look quite as pretty now. I'm hoping this one will bloom again soon. 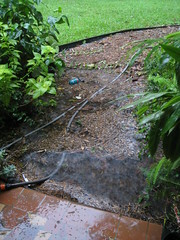 And before Fay left Florida, it dumped some additional rain on us. Some of the final feeder bands were more intense than the main storm was. 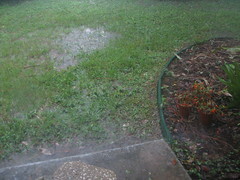 Emily blogged about the flooding in her yard. I also got a bit of flooding, but it cleared up within a day. The big problem with water oaks is that they don't hold up well in storms. 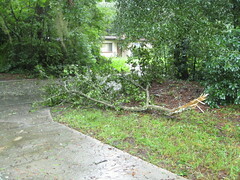 Case in point--Tropical Storm Fay just knocked this large limb out of a water oak in my yard. Even more exciting was the giant water oak that cracked open in my neighbor's backyard, snapping the power pole as it went down. Needless to say, the other side of the street doesn't have power right now. Indeed, the experts at UF/IFAS agree that water oaks have their drawbacks: "The tree often begins to break apart just as it grows to a desirable size." These trees, known botanically as Quercus nigra, are fairly common here in North Florida. They're fine in natural areas, but they aren't as suited for neighborhood settings because they pose a hazard during serious storms. I'm pretty sure that the one in my yard was a volunteer since it's growing straight out of an azalea bush along my property line. I've thought of cutting it down but just hadn't wanted to spend the money. We'll see. Maybe I'll have a certified arborist come give me an opinion about removing the tree. 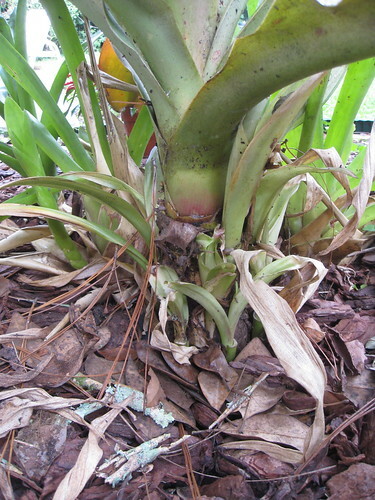 Sick crinum update -- mites! Here's what my crinum is looking like these days. A few of the leaves have fallen off since the last shot. I talked with a few people about the office about its decline and Tom suggested it could be spider mites. Bingo! I had seen some webs on the plant but had assumed they were from beneficial spiders. When I looked more closely, sure enough, there were spider mites on the undersides of the leaves. Apparently they were sucking the plant dry. 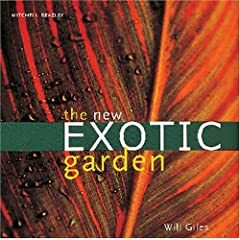 It was too late that night to take chemical measures, so I blasted the plant with the hose, which is often a good first line of defense against insects. Then later I treated the plant with a pyrethrin-based insecticide. I would have preferred an oil-soap spray, but I happened to have the other product handy. I'll reinspect in a few days and see if the mites have disappeared. If not, I'll need to treat them again. While walking in from lunch yesterday, I noticed that the 'Forest Pansy' redbud at our office had some serious munch marks. 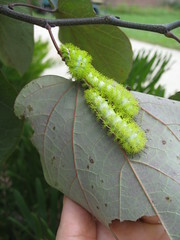 I flipped over the leaves and, lo and behold, there were several io moth caterpillars hiding out. I just love the color of these caterpillars--almost an electric lemon-lime color--so I like to get close and really admire them. But it's best not to touch--they have stinging spines on their bodies (see the tufts? ), so it's a good idea not to touch them. Caterpillars typically go through several stages before pupating and turning into moths or butterflies. These caterpillars are probably first instars, based on their markings. In time, they'll develop into io moths. The first thing I noticed is that all the little pups around its base turned ghostly pale and shriveled up. You can see the papery remains of some of the pups, plus a few that are hanging on in their current pallid state. 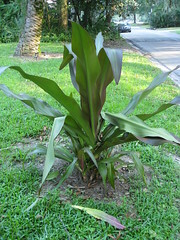 Don't be confused by the bright green leaves you see at the base--those are actually two bromeliads and aren't baby crinums. 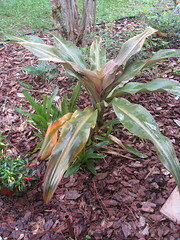 Now the foliage on the main plant is discoloring. 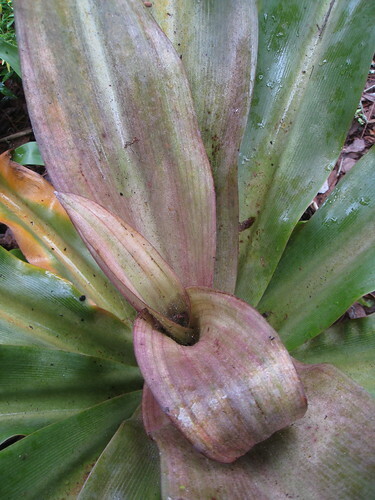 Some of the older leaves have severe yellowing along the margins, along with some rust coloration. The youngest leaves in the center of the plant look like someone sucked the color out of them. They're looking rather pinkish. I guess if they're losing chlorophyll, then the red pigments that naturally appear in this variety would be more visible. I'm going to do some research online to see if I can get to the bottom of this. Anyone else out there reading this post have any clues? NOTE: It seems that spider mites might be the culprit. I posted an update here.